Auf der Vor-Premierenreise von AIDAnova vom 23. bis 27. November 2018 wird die erste Show der AIDA Geschichte uraufgeführt, die in Kooperation mit dem Künstler Duo YELLO entstanden ist. Nach zwei Jahre langer gemeinsamer Planung, freuen sich die Weltstars der Popgeschichte darauf, die exklusive Show-Premiere an Bord des neuen AIDA Flaggschiffs zu erleben. „Es war für uns immer eine große Freude zu sehen, wie Menschen zu unserer Musik tanzen und sie interpretieren. Diese Freude ist jetzt bei AIDA umso größer, da jetzt sehr professionelle Künstler zu unserer Musik tanzen und zusammen mit den Bildern aus unserer Live-Show eine große Oper auf die Bühne zaubern“, beschreibt Dieter Meier seine Vision. „Show me! YELLO!“ verspricht ein rasantes Feuerwerk aus Tanz und Akrobatik zu den elektronischen Beats von Songs wie „Do it!“, „The Race“ und „Bostich“. Im Theatrium von AIDAnova sorgt eine 10 Meter mal 5,5 Meter große LED-Wand, die aus 11 beweglichen Teilen besteht, für spektakuläre Effekte. Auf dieser bestaunen die Zuschauer Ausschnitte der Musikvideos und Live-Shows des Schweizer Musiker-Duos während der Show. Die Choreografien der extravaganten Inszenierung stammen aus den Federn von Cirque du Soleil Akrobat Benjamin Pring und Friedrichstadt Palast Choreograf Alexei Uvarov. Dabei sind acht Tänzerinnen, zwei rhythmische Sportgymnastinnen und zwei Luftakrobaten in schrillen Spezialkostümen auf der 360-Grad-Bühne von AIDAnovazu sehen. Nitro Booking provided the sound for Volkswagen Group´s Media Event 2018 in Beijing on April 24th. Our responsibilities included Music, Sound Effects and Off Voices for the whole event that presented the current product range of the VW Group in China to invited media guests. On March 6th, the annual Mondial d´Automobile took place at the Palexpo in Geneva. The Volkswagen Group presented some of their newest products and strategies to a selected number of journalists on March 5th during the Volkswagen Group Night at Arena Geneve. Nitro Booking was responsible for music production, off voice recording, music editing and on-site support during the event. As every year, the automotive fair season 2018 kicked of with North American International Auto Show in Detroit. Next to the regular press conference, Volkswagen also participated by creating a unique brand night prior to the first press day on January 15th at the Garden Theatre. Nitro Booking was responsible for music production, off voice recording, music editing and on-site support during this great event. YELLO Live Tour 2017 kicks off! Electro pop legends Boris Blank and Dieter Meier started their Germany/Austria/Switzerland tour on November 29th in Frankfurt with a huge concert at the Festhalle, followed by their first live performance in Zürich at the Hallenstadion with 8.500 visitors. The audience was overwhelmed by the unique live experience containing 14 musicians and a very special show set up. As on every big motorshow, the VW Group presented their novelties to a selected amount of journalists on September 11th, the day before the first press day at this year´s IAA. Nitro Booking was in charge of the musical content and all sounds as well as the booking of DJane Miss Nine for the event. Nitro Booking creates the sound for the Volkswagen T-Roc world premiere in Como! On August 23rd, the new Volkswagen crossover model "T-Roc" was presented to a selected amount of journalists at the beautiful Villa Erba in Como. We were in charge of producing all sounds concerning the event and clips/graphics during the presentation and also booked DJane "Miss Nine" for the event. 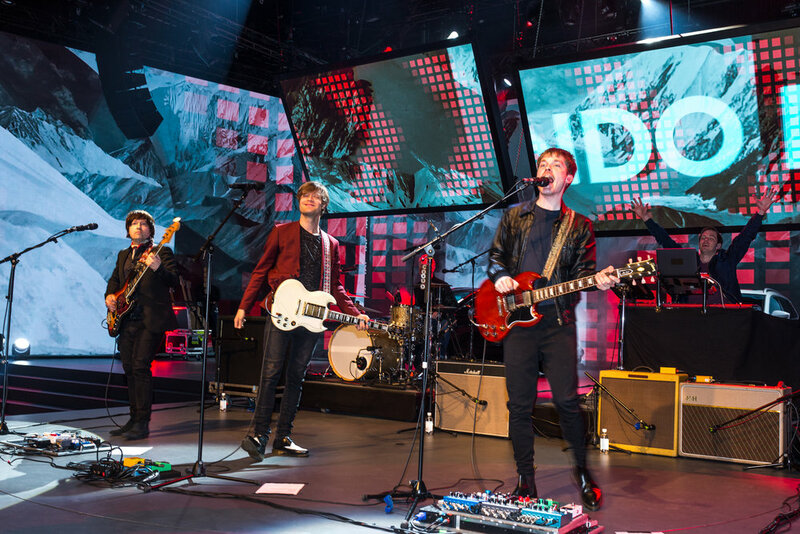 On May 19th, 2017, Mando Diao performed at the Skoda Karoq world premiere at Artipelag in Stockholm. The performance was a huge success for the client and all guests. Nitro Booking was in charge of booking, artist care and organization around the Swedish rock group´s performance. After the overwhelming success and 4 sold-out shows with YELLO in Berlin in October 2016, YELLO and Nitro Booking have been nominated for a Live Entertainment award in the category "Best concert of the year" 2017. The winners will be named at the LEA Award ceremony in Frankfurt on April 3rd right before Musikmesse Frankfurt. On March 7th, 2017 Volkswagen presented their newest models to the professional audience on the first press day of Geneva Motorshow during their press conference. Nitro Booking was responsible for music production, off voices and all other musical content during the event. On March 6th, 2017 Volkswagen Group presented, as usually, their most important news to approx. 500 invited guests right before the start of Geneva Motorshow. Nitro Booking was responsible for all musical contents during the event. After feeling the energy of playing four sold-out shows in front of enthusiastic audiences in Berlin, electro pioneers Dieter Meier and Boris Blank have decided to go on tour with YELLO in Germany, Austria and Switzerland in 2017. Supported by a brilliant cast of live musicians and background singers, YELLO will present their spectacular new arena show in 2017, featuring the best songs of their 13th studio album TOY as well as a selection of their signature songs from a recording career that spans over four decades. 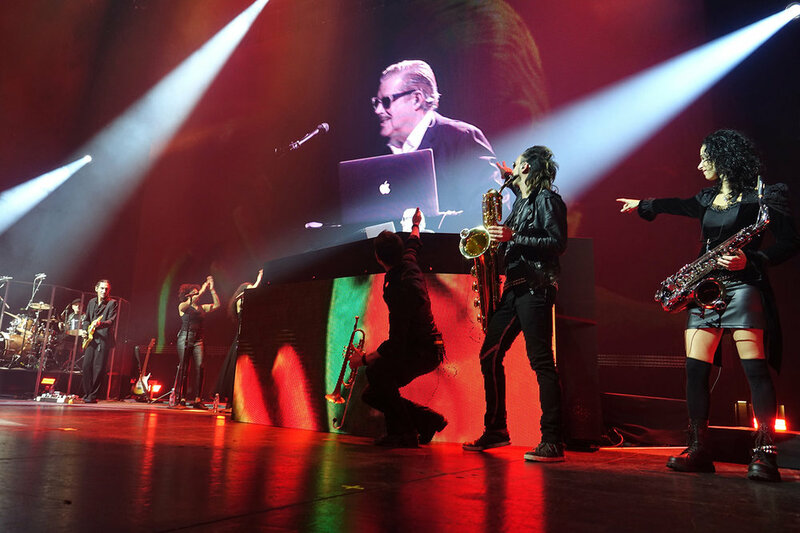 In addition, YELLO’s 2017 live shows will feature elements of their classic videos on a gigantic LED wall — many of which have found their place in major museum collections such as that of the Museum of Modern Art in New York. After four sold-out Yello live performances that have left the audiences at the Kraftwerk in Berlin speechless, Dieter and Boris announced tonight that they will DO IT again!!! The magic sound and vision experience that Yello have more than successfully staged in Berlin will be performed in selected cities and countries in 2017. Follow Yello on Facebook to make sure that you are among the first to get the breaking news where and when you can become part of the Yello live experience. Thank you Berlin! You were a great audience! Yello’s online Toy Store does not only offer a wide range of new official Yello merchandise such as t-shirts, baseball caps and beanies. More importantly, Yello also offer a strictly limited quantity of fan packages that include the last remaining tickets to their sold-out Berlin shows. On September 29th at 8.00, Volkswagen presented their newest additions to the product range. Amongst other things, the study "I.D." which is being announced as revolutionary as the beetle and the golf years ago. After seeling out the first four Yello liveshows in Berlin in a impressively short time, Nitro Booking now is exclusively responsible for Yello`s live booking! We are happy about this proof of trust and the extension of our great cooperation. On March 5th, Hip Hop star Wiz Khalifa excited his fans at Batiment des forces in Geneva during the Volkswagen Garage Sound concert. Nitro Booking was in charge of the organization of the whole event including technical production, artist support, branding, etc..
On March 1st, 2016, Volkswagen presented the new up!, as well as the concept car "T-Cross Breeze" during their press conference at the annual Geneva Motorshow. Nitro Booking produced and delivered all necessary music content and off-voices for the event and the films in the scope of the event. During the SEAT evening event on the brand`s booth on the first press day of Geneva Motorshow, Nitro Booking booked local dj Dachshund for a 2 hours set who excited the event participants with spanish style music.